THIS SITUATION arose during the first rack of a match in Derby City's one-pocket division. With the ball score at 2-0 in favor of Efren Reyes, Rafael Martinez finally got the opportunity to put some points on the board. 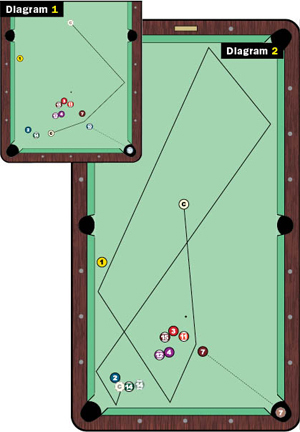 After Martinez pocketed three balls in his pocket (the lower right pocket in the diagrams), he cut the 10 ball in the corner, so the cue ball would drift out toward the middle of the table for position on the 7 ball, as shown in Diagram 1. Here's where Martinez pulled out the rabbit from the hat. Accu-Stats commentators Danny DiLiberto and Billy Incardona were clueless as to what they were going to witness. As you can see in Diagram 2, Martinez pocketed the 7 with plenty of speed, sending the cue ball around the stack and off six rails before it came to a stop in the bottom right corner. Not only was this shot played with perfect speed, the cue ball rolled into the two-ball cluster at just the right angle, nudging the 14 ball to the right, giving Martinez another shot. Even though the cue ball traveled well over 20 feet, Martinez couldn't have played more perfect position. From this position, now with a 5-2 lead in the game, Martinez never left the table. He dropped three more balls to win the first rack in stunning fashion. Martinez also went on to win rack No. 2. Just a game from defeat, Reyes took the third rack, but that's all he'd get, as Martinez won the match, 3-1, to advance. No doubt a little creativity and flawless execution came in handy for Martinez as he eliminated the five-time champion from the one-pocket event in an uncharacteristic 20th place.